Rosie is 6 months old today (see my previous post!) 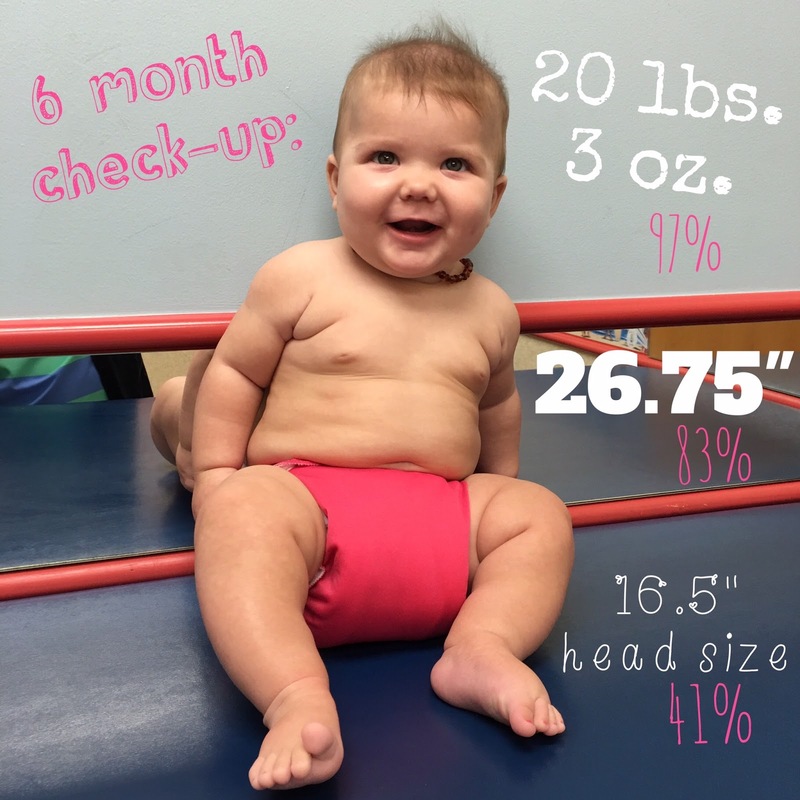 AND had her 6 month check-up today as well! #bigday! Our last time at the doc was 2 months ago when Rosie was 4 months old--so I was anxious to see how she had "officially" grown and what the doc had to say about her. Since we'd been at the doc like 10 times for Patrick in the past month for sickness, it was nice to be at the doc with a healthy kid for a well check. Rosie is still growing like a weed! She's gained about 2 pounds since her 4 month check-up, and an ounce since I weighed her yesterday for her 6 month mom stats! Crazy! And I guessed she was about 27 or 28 inches, so I wasn't far off. Nice to see that she's taking the opposite track as Patrick with a smaller noggin' too. Hehehe. She's our cute short little chubby bubby. Overall it was a great check-up for Ro Ro; she's eating well, hitting her milestones, and an all around happy and content baby. The doc didn't seem concerned at all with her not rolling over; saying that bigger babies really have a hard time with this, and she may just be happy as can be on her back (this is what I think). She did tell us (again!) to start on solids...so yeah, we will eventually :) I really am in no hurry to do this, even though our doc is pushing it saying that the longer we wait the more aversions (really?!?!) she'll have to foods. Guess we'll find out when she starts solids! Ha! Anyways, a good check-up all around! Rosie did get three terrifyingly awful shots and one oral vaccine. Poor little bean. But she takes shots much better than Patrick (even still!) and she was all calmed and settled down like 3 minutes after them. Touch chica she is! We don't go back to the doc for another well check until 9 months for Rosie, so, knocking on wood as I type this, she's totally healthy and fine until then and we don't have any sick visits to the doc--fingers crossed! Oh, did I mention Patrick came with us this morning?! Yep, kid woke up screaming at 6am saying his ear hurt. Poor dude...but just a mild ear infection and cold for him, which hopefully he'll kick soon.